Exposure: Lum. = 100 min., Red & Green = 55 Min. Each, Blue = 50 min. 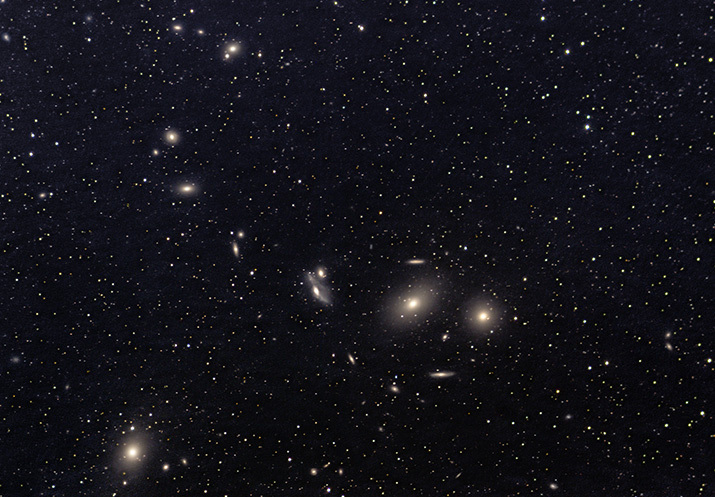 In the image above the string of galaxies extending in an arc is known as Markarian's Chain and is a feature located in the large Virgo Galaxy Cluster. The two bright elliptical galaxies located at the right end of the arc are designated M84 and M86. These were first discovered by Charles Messier in 1781. Located third from the end ar two interacting galaxies, NGC 4438 and NGC 4435. They are known as "The Eyes". The bright elliptical galaxy located in the lower left corner of the image is designated M87 and is not part of Markarian's Chain. At least seven Chain galaxies appear to move in a coherent motion. B. E. Markarian discovered this common characteristic in the early 1960s. The chain was ultimately named for him.